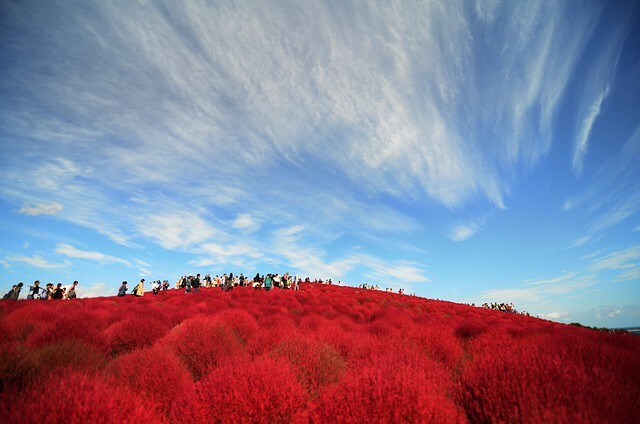 Often listed as one of the most surreal places in the world, Hitachi Seaside Park is a must visit destination in Japan. 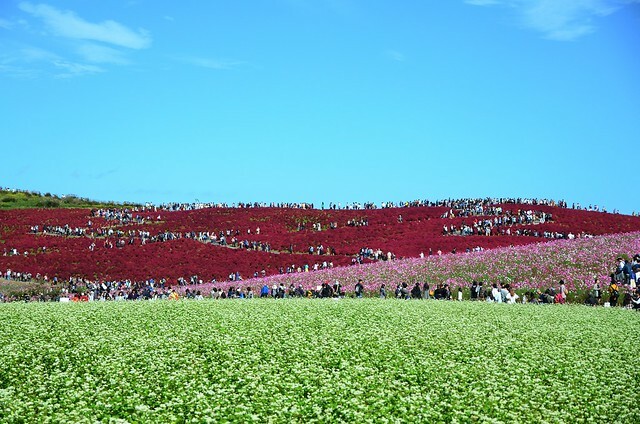 The park is very popular in Ibaraki Prefecture just days before the peak of autumn. 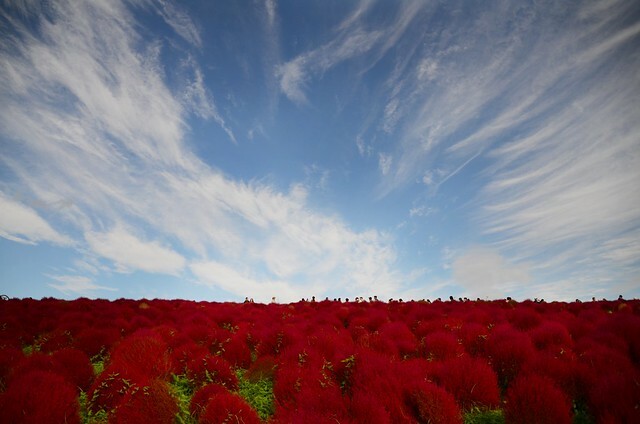 The red-colored firebushes / kochia flooding the park is a sight to behold especially to photo enthusiasts like me. One would want to stay there forever. This was my fourth time visiting the said place and I have tried various means of travel. I even joined a photography bus tour before. But this time, since the park is approximately 150 km away from Chiba, we decided to rent a bus for convenience. And we were right. 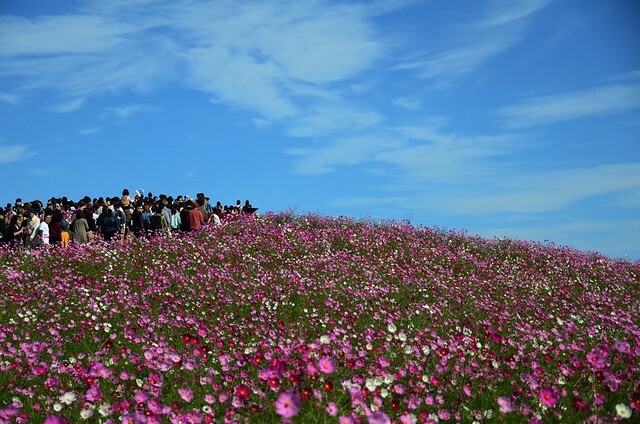 We need not chase the once-a-day bus trip from Tokyo Station to Hitachi Seaside Park. 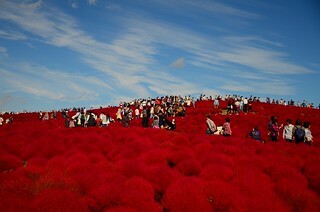 The entrance fee was waived during our trip, we were able to save 490 yen but as expected, the crowd was enormous. 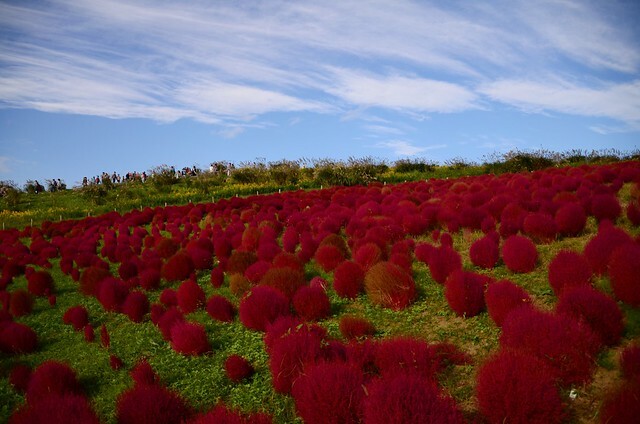 Aside from the kochia aka kokia in Japansese, there are other families of flowers carpeting the park. 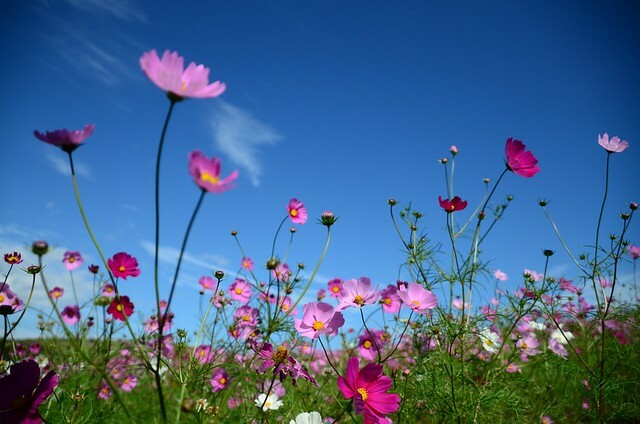 One of the popular one is the cosmos, complementing the reds of the kochia. Two years ago, we joined a photography bus tour but a typhoon was brewing that day. The sky was gray and dull. I kept on hoping that for this trip, the sky will be clear. And it was granted. The clouds were even a show-off. 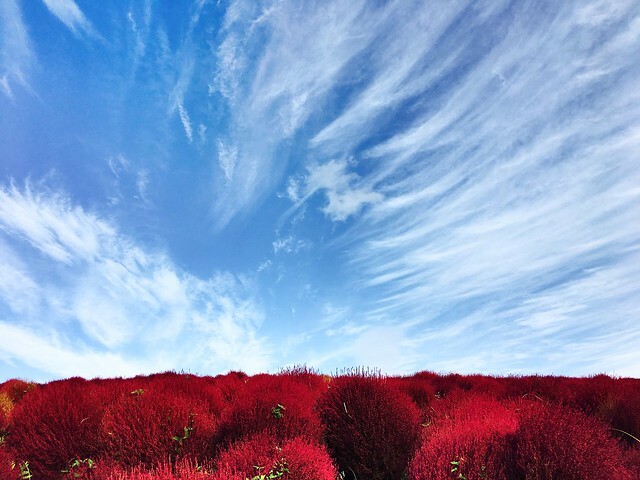 I always wanted to capture the contrast between the blue skies and the red bushes. 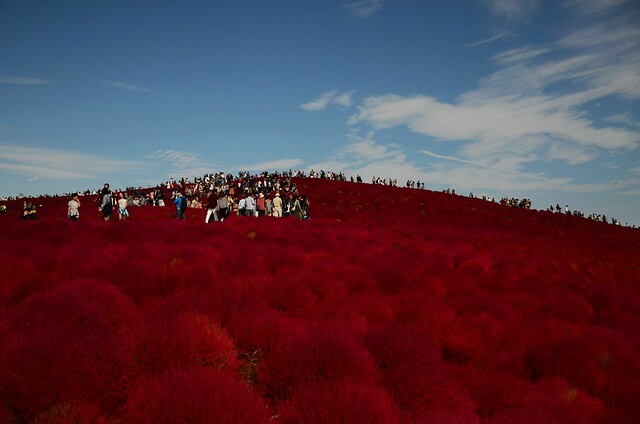 The hill where the bushes grow is jam packed with sightseers. I can’t blame them since I also took hundreds of photos. Each one is finding his / her own spot free from people for a souvenir shot. The place feels so cinematic. 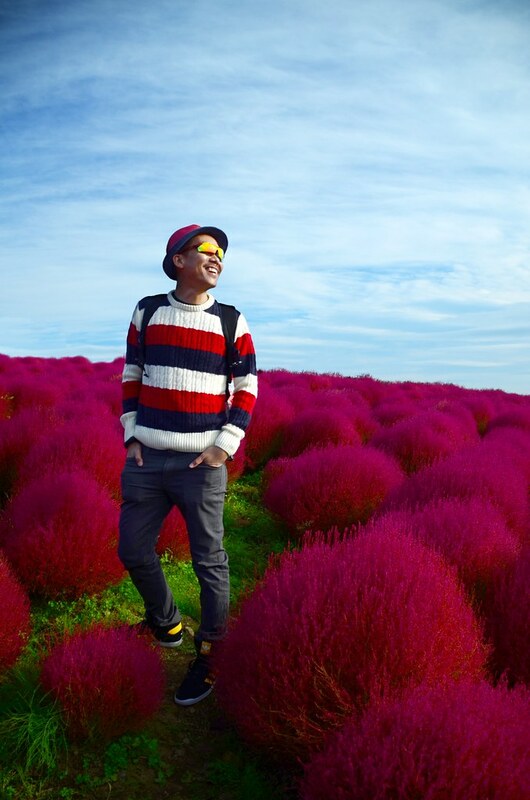 I enjoyed watching the bushes sway with the breeze and the grasses. It’s my definition of quite a perfect day. As the sun began to set, we were reminded that it’s time to go home. Hopefully I can go back here this winter. 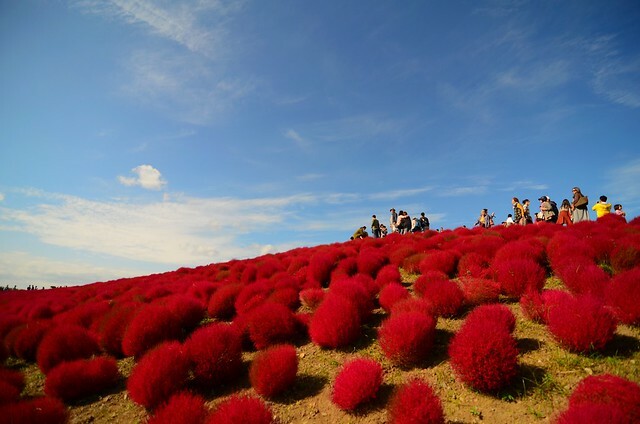 Here are my previous posts about Hitachi Seaside Park (Spring, Summer, Autumn). Can we afford to live in our memories? Safe. But is it? Warm? But is that enough? If tehy world is without colour, should we wonder why? I do like the idea of, when you need to, to go back to that place where there was a 'perfect day.' I like that you have traveled back to this place again and again, duplicating the experience in some ways, and having new experiences in other ways. Your photos are breathtakingly beautiful. You find such beautiful places in YOUR environment, which always makes me think...can we all find such beautiful places in our own? Have a nice week ahead Gillena. Thanks! Your photos are gorgeous, as always. I especially love what the sky was doing, in contrast to the red hues. Gorgeous cloud-show! Clouds were a show-off that day, Sherry! Thanks! Your comments, your poem, all the photos are spectacular. But that last one with your smile is my favorite. Thank you for sharing your day. I cannot express my wonder and the beauty when I visit and read on your site. Thanks ZQ. My pleasure to share always. These photos are so vibrant, I think we can find vibrancy in our lives through the memories captured with our lens. Your posts are pure joy to visit! And your poem is wonderful! Thank you for this! Mindblowing... thanks so much for sharing. 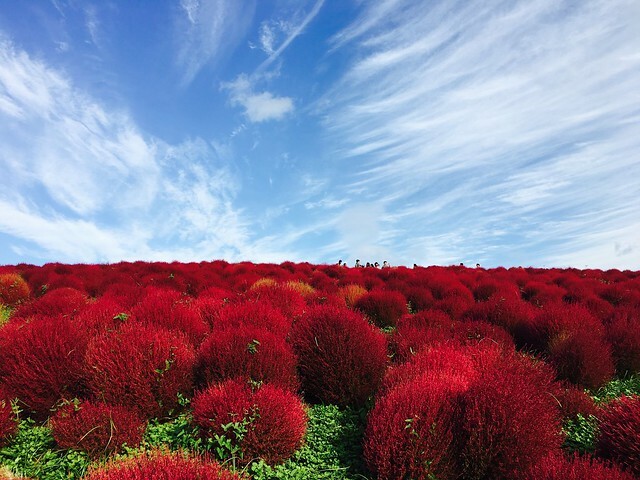 Fantastic scene totomai! 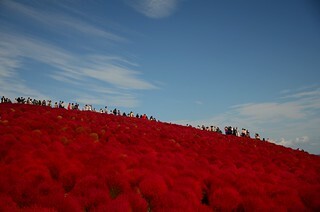 A sea of crimson goodness for all to see! Thanks for info!